In the daytime, Halong Bay is beautiful as a place with beautiful landscapes, do tourists. Not only beautiful in the day. But when the night down, Halong also brings a wonderful sparkling beauty that hard to compare anywhere. When the sun falls down, the Halong Bay tourist area is lit up with millions of lights glistening and shining. This is also the most exciting time for Halong Nightlife. 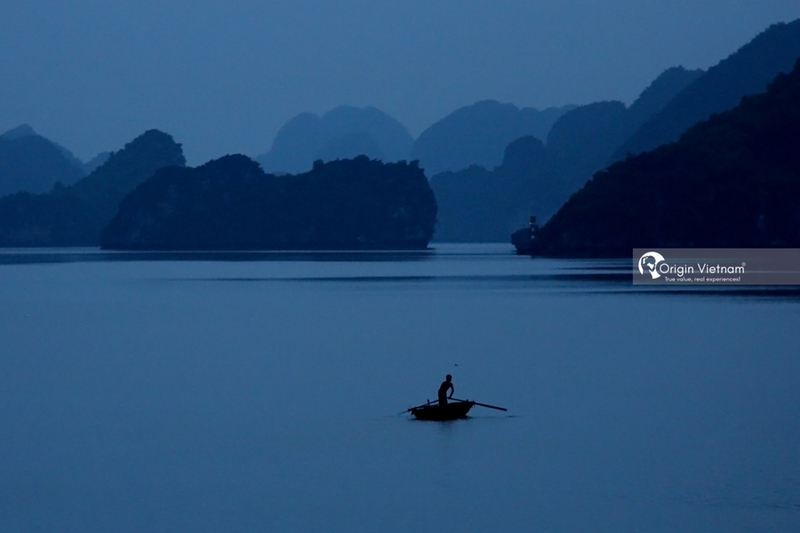 Follow Origin Travel to find how the beauty of Halong Bay at night through this article. If anyone has been to Halong Bay certainly will not forget the scene of Halong City at night. Halong City at night very beautiful. When night falls, the streets, seaports and bridges in Halong Bay become glittering and charming in the light. Night is also at the entertainment spots such as bars, restaurants open to welcome guests. Halong Nightlife is also exciting and bustling Halong Bay in the daytime. The tourist attractions in Halong Bay at night are Bai Chay Bridge, Bai Chay Beach Road, restaurants and bars. Guests can enjoy the view of Halong Bay at night on the boat, eat and sleep on the bay. At any angle, Halong Bay at night is also brilliant in the lights, both inside the city, on Hon Gai town, Tuan Chau island or under the harbor. If you want a quiet space to think, visitors to the cafes near the beach with views of Halong Bay. If you prefer a vibrant nightlife, head to the Beach Bar to enjoy the music, the sea and the light. Bai Chay bridge is very beautiful in the evening. This is the symbolic cable bridge of Halong Bay, connecting the two sides of Bai Chay - Hon Gai. Standing on the bridge, visitors can enjoy panoramic views of the beaches, the arcades, the high-rise buildings lit in Halong city. Far below the Cua Luc, visitors will see the small boats are quietly drifting along the water. Dropping on the Bai Chay bridge at night is also a chance for visitors to drop their souls in the space of only the wind and the sound of water splashing between Cua Luc River. Bai Chay is also an ideal place for tourists to take pictures of Halong at night. 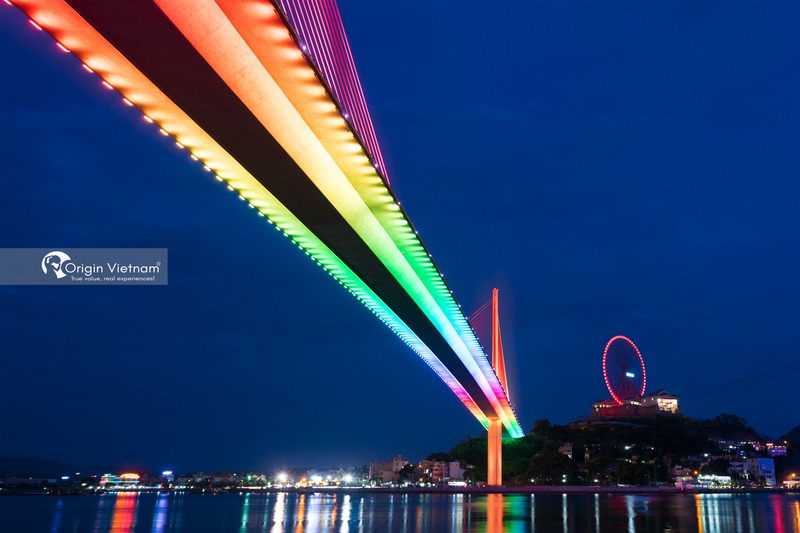 Standing on the bridge or walking along the dyke embankment, visitors can see the beautiful shimmering color of Bai Chay bridge. Halong Night Market is located on the beautiful Bai Chay beach where shopping, sightseeing and entertainment of visitors every night down. The market opens to visitors from 6pm and operates until late. 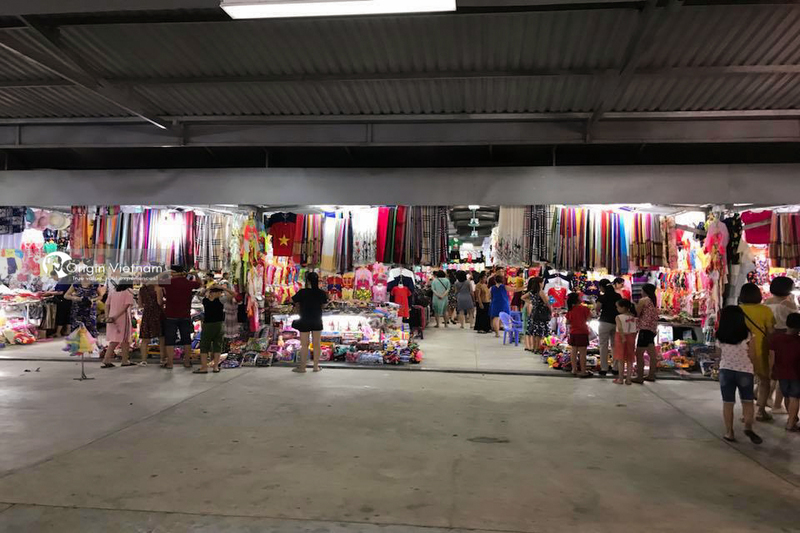 Visitors to the night market have both local people, domestic tourists and foreigners. Halong night market in Halong, visitors will be visiting many stalls selling souvenirs, eye-catching handmade jewelry or the shop selling clothes print Halong Bay, Tuan Chau Island Especially, the stalls sell jewelry, bracelets and key hooks made of shell, shells always attract the attention of European and American tourists. They usually choose to buy 1, 2 rings, some key chain to wear and gifts to relatives before returning home. If you want to find a place to eat near the sea, then go to Halong night market. Here, visitors will be eating delicious seafood dishes in romantic sea space. Since its opening in 2014, Halong nightly food street has become a popular stop for evening meals. The Food Street includes over 80 booths selling a variety of seafood and local dishes. This place sells all kinds of Halong specialties such as bored, superficial, lobster, oysters ... are baked grease, fried or steamed. Especially, inside the nightly food street there are booths selling all kinds of snails. 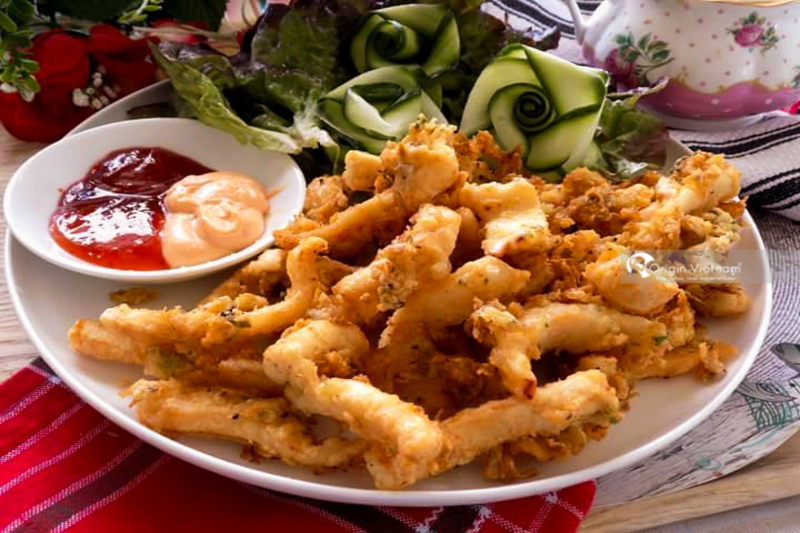 At prices from 20,000 - 30,000 VND / dish, visitors can enjoy dozens of snails that taste enough to be grilled or fried me very attractive. At night, Bai Chay Beach Bar is open. 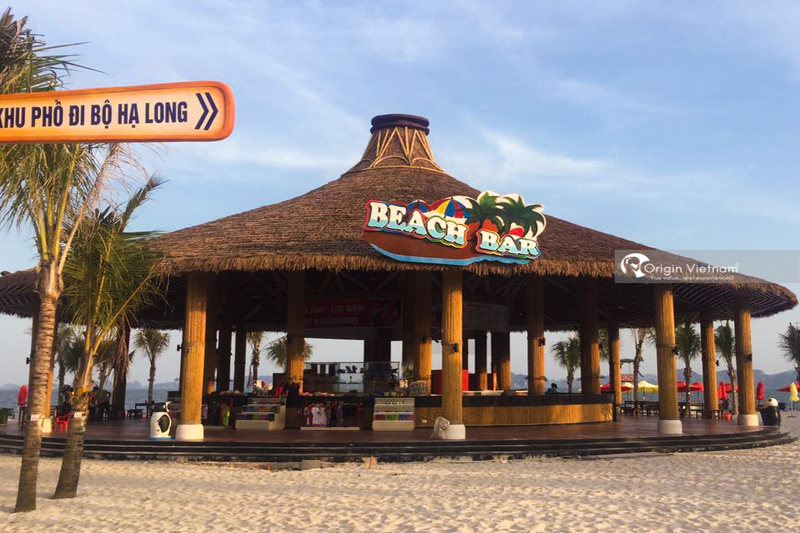 This is an outdoor open-air bar, with quite space for visitors to sit down to enjoy drinking water, listen to music and watch the Halong beach at night. Bar is designed in a youthful style, visitors can sit or walk comfortably between tables to enjoy drinks, chat together. When the music in the Bar is also the time to live in the vibrant music and young dance, attractive. The vibrant atmosphere of the Bar Festival attracts young visitors and often goes to the Bar every night. "It was a really great experience, the feeling of being alone on the side of the ship, around the wind and the whirring of the waves. Which made the human heart feel calm and peaceful." of a visitor to Halong and overnight on the boat. Travel to Halong, visitors should try to experience the feeling floating on the cruise between the vast space of Halong Bay. It's easily book a cabin for $ 1.7 million - $ 10 million per/ room/ night depending on the quality of the cruise. Boats will take visitors to the famous Halong tourist sites during the day and in the evening, visitors will enjoy the sunset, then sleep on the cruise. Once you have chosen the ideal anchorage location. The cruise will be fixed in place, waiting for the sunset down in the quiet space between the bay. Before sleeping, visitors should enjoy the specialties prepared by chefs on the boat. Bed rooms are equipped as a luxury hotel room for travelers to feel the most comfortable. In addition, guests also have wifi access onboard for leisure or work depend on cruise you choose. Many travelers often ask that sleeping on Halong Bay is safe? The answer is safe. When tourists want to sleep on the boat. 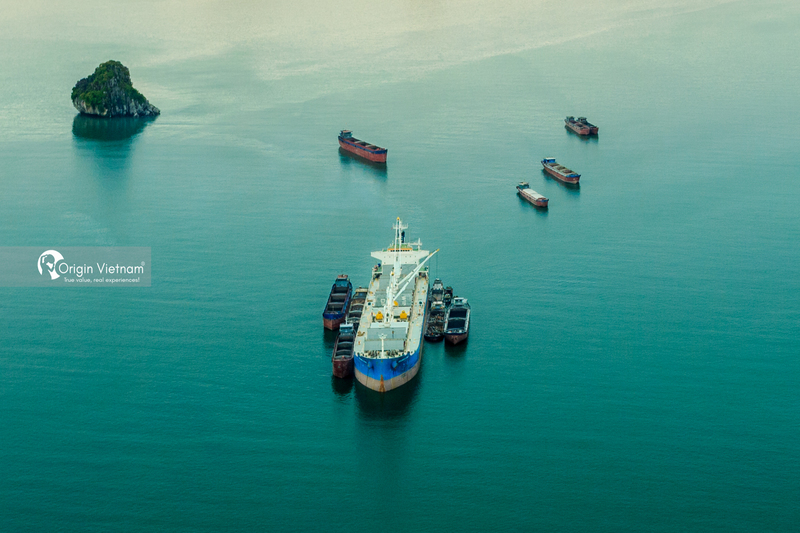 Quang Ninh Inland Waterway Port will update weather conditions and then allow visitors to anchor at that location. Ship is anchored fixed, not moving so visitors will feel like the ship is anchored in the port. In addition, anchorage points are usually fixed a few points. There will be several other ships overnight also on the bay. If there are problems will help people to help. Halong nightlife is great? Halong Bay has become a popular tourist destination of domestic and foreign tourists. If you have the opportunity to visit Vietnam. You should visit Halong Bay to enjoy the beautiful scenery, enjoy the delicious food and experience overnight in the bay on the boat.